The importance of innovation for companies to gain competitive advantage is widely acknowledged. While earlier studies have emphasised the critical importance of idea assessment as part of the new product and new services development process, the topic has been under-represented in academic research recently. In this paper, we aim to provide an overview on the depiction of idea assessment in services research. 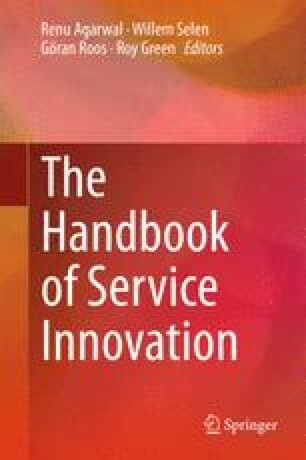 For this, we start by exploring the representation of the topic in question in recent service innovation capability frameworks. On a more operational level we reflect service-related publications on criteria, information sources, group compositions and approaches for idea assessment. Finally, by reporting on a case study with a German financial services provider, we introduce serious games and enterprise crowdfunding as two novel approaches for assessing service ideas. Overall, we find that internal, service providing staff should play a major role in the assessment of service ideas. Surprisingly, classical portfolio management approaches making use of deliberation in small management boards seem to be the predominant method discussed in the literature and applied in practice. Mechanisms which are designed to involve larger crowds into idea assessment exist, however, are not yet widespread. The two novel approaches show promising avenues for involving service providing staff into idea assessment in a motivating way.